The Travelon Anti-Theft Hobo Bag gives a fashionable touch with unmatched security. The bag has an organized compartment with RFID blocking card slot which protects from electronic pickpockets. This hobo bag provides roomy main compartment with pockets for organization, an open top wall pocket and a zippered wall pocket. The easy access, locking front zipped pocket, and rear snap-close pocket are perfect for a phone or quick grab items. 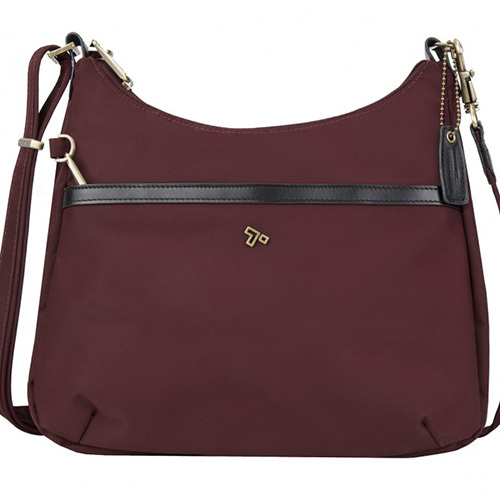 Strap Drop Length: 16.5" – 28"
The Travelon Anti-Theft LTD Hobo Bag-Wine has many exciting features for users of all types. You can extend the lifetime of your Travelon Anti-Theft LTD Hobo Bag-Wine with the purchase of a FactoryOutletStore Factory Protection Plan. 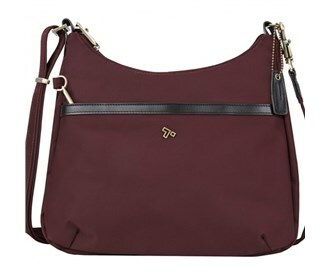 See the Travelon Anti-Theft LTD Hobo Bag-Wine product video and gallery images above for more details. The Travelon Anti-Theft LTD Hobo Bag-Wine is sold as a Brand New Unopened Item.